As the construction industry nears the third decade of the 21st century, it has begun to transition toward prefabrication and other manufacturing techniques—not only to circumvent labor shortages but also to build faster, more cost effectively, and with fewer materials. 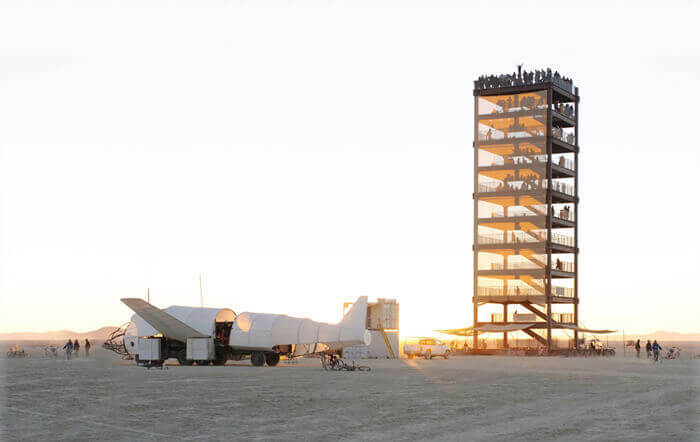 The 10-story Portable Tower was erected at Burning Man in Black Rock Desert, Nevada, in less than four days and disassembled in a day-and-a-half. Courtesy ConXtech. The October 2017 wildfires that destroyed thousands of homes in Northern California might prove to be the catalyst that spurs wider adoption of prefabricated houses. The combination of a tight labor market and the state’s strict building codes has caused long waiting times for residents eager to rebuild. Startups like Connect Homes and Acre Designs have stepped in to fill that need, manufacturing construction materials and offering homeowners an opportunity to build smart, efficient homes in a fraction of the time and with less labor. According to sources in the region, Saudi Arabia’s “Vision 2030”—an ambitious plan to diversify its economy, modernize its infrastructure, and improve government services—must turn to technologies such as 3D printing, augmented reality, and virtual reality to be successful. While companies in the Middle East have embraced BIM, they need to adopt new construction and manufacturing techniques to maintain growth.